I'm reading the Betsy-Tacy series by Maud Hart Lovelace at the prompting of Sarah from Library Hospital who is hosting a Maud Hart Lovelace Reading Challenge. Sarah has been talking about her love of the Betsy-Tacy for awhile and I kept thinking that I should probably get around to reading them. Her challenge was the prompting I needed! If you'd care to participate, you have a whole month to do so, so jump on in! Naturally I started at the very beginning with these books with the first title, Betsy-Tacy . In this book we meet two little five year old girls, Betsy and Tacy. Betsy has brown mousy hair, worn in braids. She is an exuberant child, full of mischief and fun. Tacy has long red hair which she wears in ringlets. She is bashful and shy and does not make friends as easily as Betsy does. 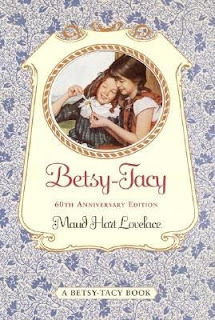 Betsy manages to win Tacy over during her fifth birthday party and the girls become the fastest and closest of friends. Pretty soon they are almost viewed to be one person because they are always together. Betsy and Tacy's friendship is charming. I think the appeal of the first book that made me want to read the second book is the simplicity and ferocity of their friendship. These are two girls who just love to be together, rain or shine. I love that their mothers served them their individual dinners on plates that the girls would then carry out into the street. They would meet up with each other, dinners in hand, and eat with one another while imagining all sorts of adventures. Friendship for adults seems to take so much work and effort and can grow tiresome. It is pleasant to sink into a book where friendship was natural and assumed and where two girls made the best of things. I love that. It made Betsy-Tacy such a peaceful, relaxing read. In Betsy-Tacy and Tib , Betsy and Tacy introduce a new girl into their circle (named Tib, of course!). People in the community speculated that the friendship of the three girls would not survive because it is far easier to be on close terms with one person than two. However, survive the friendship did! It even thrived. If it was possible for me to love these girls anymore, I wouldn't be able to imagine in! How'd I miss this series when I was growing up!? Thank you, Sarah, for the motivation!) Betsy-Tacy and Tib made me laugh out loud in several spots. My favorite part of this book is when Betsy decided that the best memento that they could have of each other was a lock of hair. They would each cut off some of their hair (Betsy's brown, Tacy's red, and Tib's blonde) and braid it together. ("A three-fold chord is not quickly broken . . . Ecc. 4:12" )Instead of snipping off a few strands of hair, the girls cut off half of their hair. It's rather an Anne of Green Gables guffaw and I totally loved it! After completing the second book I decided that I absolutely had to read more of this series so it was off to the library again. Stay tuned because I'll definitely be sharing this month with some clever and all-together fun little girls! We LOVE the Betsy-Tacy books at our house! My MIL introduced them to us when my oldest was 5. They are as much loved as the Little House books. I can't wait to explore your site more as a fellow avid reader and lover of books. No wonder you wrote your favorite gift was a book you've wanted for a while. I'm your Noel Sisters' Shoebox, Swap partner! I am a Julia so also enjoyed these lovely books. Great review! I remember coming across "Betsy, Tacy, and Tib" in our local library when I was in the second grade (the year I got my own library card). I loved those girls and I read every Betsy-Tacy book that the library contained.